Seoul and Washington are reportedly in favor of U.S. marines being deployed on South Korea's west coast to prepare for an emergency. The mooted redeployment of U.S. marines from a base in Okinawa, Japan to South Korea on a rotating basis would fit in with their hopes. But the U.S. Marine Corps is essentially an attack unit focusing on amphibious operations, and its deployment to South Korea could upset neighboring countries other than North Korea, especially China. The issue already raised hackles in 2010. In June 2010, President Lee Myung-bak told his U.S. counterpart Barack Obama that Seoul would provide facilities in South Korea if a conflict then brewing with Japan over the relocation of the Okinawa base took "the worst possible turn," according to Japanese monthly Bungeishunju. Cheong Wa Dae strongly denied the story at the time. More recently, the idea of deploying marines to South Korea has resurfaced due to the death of North Korean leader Kim Jong-il and the U.S. military's decision to redeploy 3,300 of the marines in Okinawa to other countries on a rotating basis. The chief aim is to cut U.S. defense spending, because permanently stationing soldiers in a foreign country is vastly more expensive than rotating them. Marines conduct a landing drill in Okinawa in 2010 when 20 countries from the Asia-Pacific region including Korea, Japan and the U.S. participated in the "Cobra Gold" exercises. Many government officials are said to be counseling prudence because the political ramifications could be unpleasant. China, which has on occasion called the Seoul-Washington alliance a "legacy of the past," strongly opposes an additional deployment of U.S. troops in South Korea. It feels that deployment of marines in South Korea could strain Seoul-Beijing relations and cause conflict with Washington as well due to fears that the elite troops would be capable of landing on the Shandong Peninsula. North Korea could also feel provoked. Another worry is that all foreign and security issues are likely to become politicized as general and presidential elections loom in April and December this year. 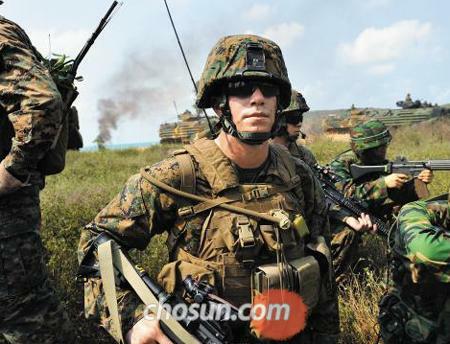 A government source said, "Nobody knows what will happen if opposition parties make hay with the deployment of U.S. marines here to claim that the Lee Myung-bak administration is provoking a war." Seoul and Washington are therefore apparently thinking of a flexible or gradual way of deploying the marines here.